Dr Karen Stockin talks to Jennifer Little. Karen Stockin’s parents probably guessed that their teenage daughter would have an unusual career. The family tradition was that they would pay for a lavish 18th birthday party for each of their children. Karen wanted something different. She asked them to help pay for a trip to Monterey Bay off the coast of California; the girl from the UK’s land-locked county of Staffordshire dreamed of seeing a blue whale. She saw blue whales. She saw orca, bottlenose and Risso’s dolphins, and schools of sunfish and sharks. “I came back completely focused. I knew marine biology was definitely for me – there was nothing else,” says Dr Stockin, now a lecturer at the Institute of Natural Sciences on the Albany campus, where last year she completed her doctoral thesis on the so-called common dolphin. Hers is a varied job description. At one moment she is at the podium in a lecture theatre; at the next in the lab crunching data on the computer; or out on the water logging dolphin behaviour; or up to her knees in the viscera of some long-dead beached whale; or evangelising to groups of spellbound school students – perhaps in the classroom perhaps on a dolphin-watching trip – about marine conservation. 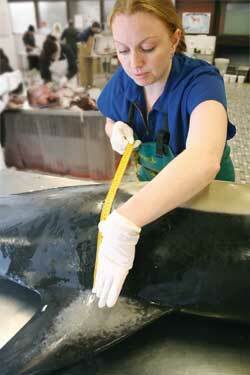 Stockin first began studying dolphins in Moray Firth while working towards her MSc at Aberdeen University. These were bottlenose dolphins – think Flipper – but partway through her studies she took a month-long internship with Massey’s Dirk Neumann. Then a PhD student based in Whitianga, Neumann was carrying out the first dedicated study of New Zealand common dolphins. When the time came for Stockin to do her PhD, she decided to switch species and countries. The common dolphin is a genus of medium-size dolphin, coming in at 1.6 to 2.7 metres in length when adult, and found over a number of ranges worldwide. 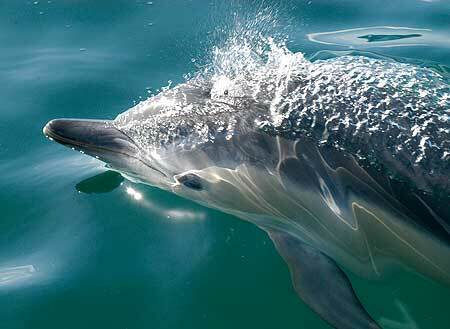 In New Zealand waters the common dolphin is particularly found in the Bay of Islands and the Hauraki Gulf and other areas around the top part of the North Island. There are reasons for this. Imperilled species such as the Maui and Hector’s dolphins (both of which are on the Red List, the so-called Oscars of extinction) naturally attract a large amount of research interest. But it would be a mistake for researchers to concentrate on endangered species to the exclusion of all others, says Stockin. “Some scientists have suggested that it is the more abundant species which drive the ecosystem. If those populations become damaged, it’s going to have a bigger effect on the ecosystem as a whole than losing smaller numbers of already endangered species,” she says. To manage the conservation of the New Zealand common dolphin, you need to understand its diet, breeding patterns, susceptibility to pollution, and how it is affected by human activities such as tourism and fishing. You need to have some verifiable measure of populations numbers to understand whether the population is healthy or in decline. In pursuit of data, Stockin has spent many sea-going hours observing dolphins going about their daily lives. But there is a more macabre side to the work as well: postmortems. The Department of Conservation turns to Stockin when dolphins or whales beach and die in the Auckland/Northland region. It is messy, smelly work. The animals she dissects have often been many days dead when found and the formalin in which they are sometimes preserved adds its own distinctive whiff. Once the police stopped her on the road from Auckland to Palmerston North. They had noticed the tail flukes of a dolphin protruding from the window of her truck. The dolphin was pungently dead; they were not keen to detain her from her business, she remembers. Habituated to the smell of dead dolphin, Stockin has to be careful not to carry her work around with her. “The oil from the blubber clings to you – you need to shower and wash your hair a couple of times to get rid of the smell,” she says. Post-mortems have enabled Stockin and her colleagues to describe the diet of the New Zealand common dolphin and have shown that the animals often have elevated DDT levels. She has also found numerous plastic bags in the digestive tracts of dolphins and whales – when talking to school children she is sure to mention that a carelessly discarded plastic bag washed down a storm drain can materially contribute to the death of a marine mammal. Stockin’s thesis, The New Zealand common dolphin (Delphinus sp.) – Identity, Ecology and Conservation, is the first scientific investigation into the taxonomy, diet and life history, and she expects to release the first-ever population estimates for the New Zealand common dolphin later this year, and in June she will present data on the status of the common dolphin in New Zealand to the International Whaling Commission’s meeting in Madeira, Portugal. Stockin was an instigator of the New Zealand Common Dolphin Project, founded in 2002, under the auspices of the Coastal-Marine Research Group based at Massey’s Institute of Natural Sciences in Albany. The project, a long-term research and education programme aimed at raising awareness of the species and contributing to conservation efforts, received a grant from the New Zealand Geographic Trust’s first funding round last year and has applied for Marsden funding.